John Vidal has a curious piece in the Guardian about the exceptionally cold winter. Unlike the taz (see Werner's separate post) he does not seek evidence for the link between climate change and record cold weather in March. He just affirms that 'the weather is behaving just as the climatologists predicted it would as the planet warmed: with extremes of weather.' Exceptional cold weather, just as exceptional warm weather, are instances of climatologists' predictions. Easy. But apart from everyone feeling cold and grumpy for the last 11 months, what cultural, economic and social effects does a missing spring or a string of bad summers produce? Determinists would say that human habits and characteristics are shaped by geographic conditions, and there is plenty of evidence. In 1816, the miserable weather encouraged people to emigrate. In Germany, the shortage of oats to feed horses is said to have spawned ideas that led to the development of the bicycle. In Switzerland, the Shelleys and their chums were kept indoors by the "wet, ungenial summer" and so wrote stories such as Frankenstein. Perhaps we can expect a mass flight from northern Europe, a flowering of the arts from those left, and everyone growing their hair longer to keep warm. There are reasons to be cheerful then. Two things are striking here. Unlike the dreaded migrations from poor countries (which would have terrible effects on our Northern societies, according to dominant climate narrative) here we have a positive prospect of climate change impacts. I am not sure how much of this is tongue in cheek: he says 'determinists would say...' But he believes there is 'plenty of evidence' for such a view. So expect a largely positive push for the development of creative solutions - and presumably those who emigrate to warmer countries will bring positive contributions there, too (but Vidal is silent on this putative civilising influence, probably for good reasons). The determinist explanation of creative development seems to be a cultural staple of British thinking, just as Jeremy Paxman once claimed the English weather is the reason for such a creative pop music scene. Or is it just a sign of modesty to claim environmental factors as causes for creative achievement and not unique cultural development in combination with individual achievement? These deeply rooted cliches need examination. Why did it not occur to Vidal and others that unfavourable climatic conditions might spurn creativity in other regions of the world? Why assume that migration of Northerners to Southern countries is unproblematic? A wee bit off-topic, but this is what occurred to me when reading Vidal's article. The hottest spring since records began? 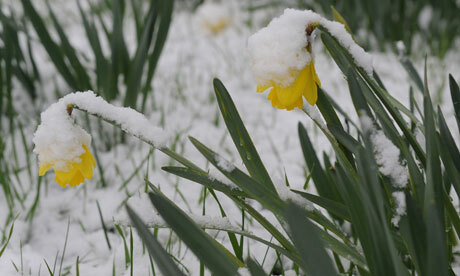 The coldest spring since records began? A spring with the most average temperatures since records began? Right on the hot spot, Charles! "He just affirms that 'the weather is behaving just as the climatologists predicted it would as the planet warmed: with extremes of weather." "According to Dr David Viner, a senior research scientist at the climatic research unit (CRU) of the University of East Anglia,within a few years winter snowfall will become "a very rare and exciting event". "Children just aren't going to know what snow is," he said." "David Parker, at the Hadley Centre for Climate Prediction and Research in Berkshire, says ultimately, British children could have only virtual experience of snow. Via the internet, they might wonder at polar scenes - or eventually "feel" virtual cold. Heavy snow will return occasionally, says Dr Viner, but when it does we will be unprepared. "We're really going to get caught out. Snow will probably cause chaos in 20 years time," he said." So 13 years ago, global warming was going to be constant and inevitable. Now? Climate change is all things to all climatologists.